The Petromax Transport Bag is a great way to carry a Petromax Atago, Petromax Dutch Oven or a Dutch oven of similar size wherever you go. The bag is available in three different sizes. The bag is woven fabrics made out of reinforced nylon ripstop that makes the bag resistant to tearing and ripping. 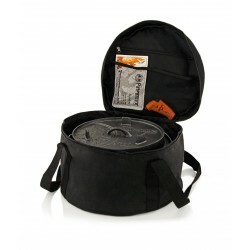 Consequently, the bag provides greatly increased durability. Inside the bag’s cover one zipped pocket area and two slide-in pockets offer space for various accessories. They are perfectly suited for the Petromax Zunder and the hf1 or hf2. 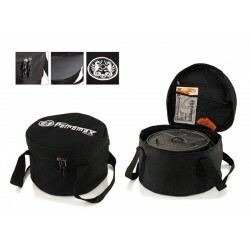 The Petromax FT-TA bags are the ideal partner for your petromax atago, or dutch oven.